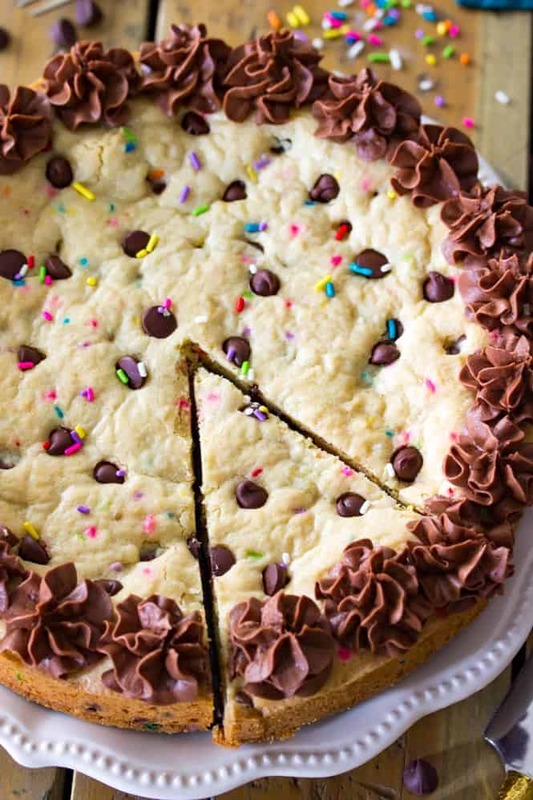 A giant soft baked chocolate chip cookie cake! 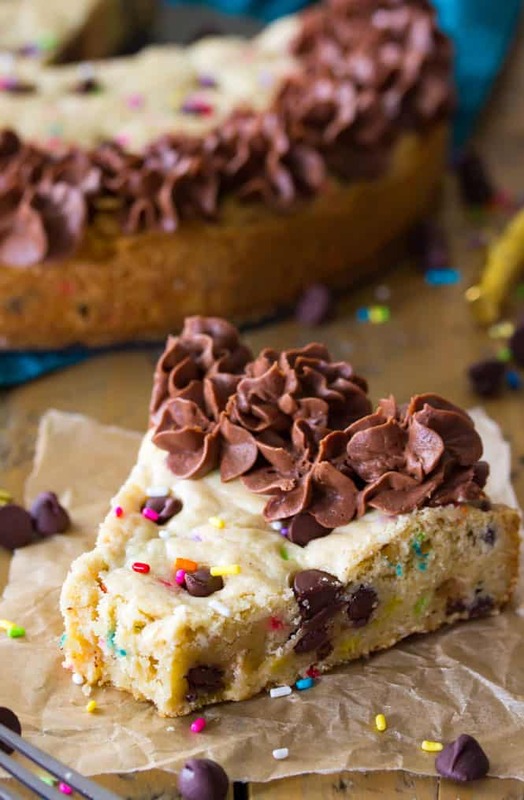 Filled with colorful sprinkles and topped off with a rich chocolate frosting, this would make a great birthday cake substitute! 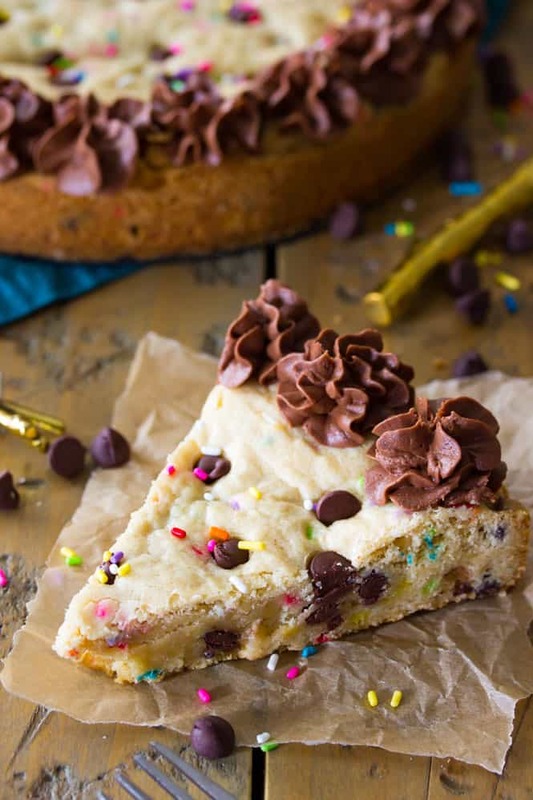 I originally shared this chocolate chip cookie cake over on The Stay at Home Chef! After the past two plus years of blogging I estimate that I’ve gained around 698 lbs or so. I can only estimate because I’m about as eager to step on a scale as I would be to step on a rattlesnake. Honestly, at this point I’d prefer the rattlesnake. 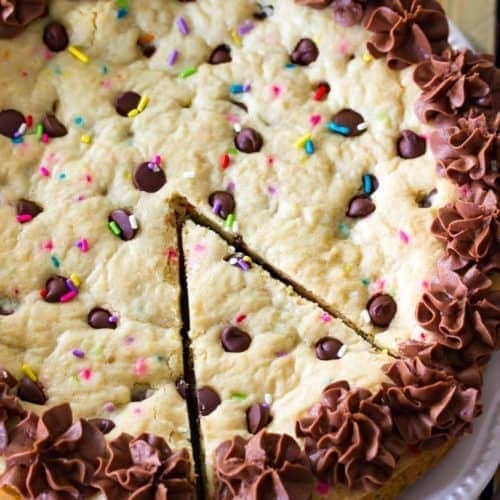 I finally joined a gym yesterday to take a stride to combat the effects of these desserts (especially these life-ruining chocolate chip cookies), and in true sugar-addict fashion I’m skipping the gym today to join my sister for her birthday dinner at the Cheesecake Factory and to pig out on cheesecake and a slice of this giant chocolate chip cookie cake. My mom made Jaclyn an elaborate birthday cake, like she does for each of us every year, that I can’t wait to dig in to, but I also have this giant, chocolate frosted cookie cake sitting on my counter at home just calling my name and I can’t seem to resist reaching for a slice each time I walk past. I used a slight variation of the same chocolate frosting that I used on my chocolate cupcakes, it’s simple to make, smooth, creamy, and richly chocolaty. It also can be made in just one bowl meaning that there’s no reason to not top your cookie cake off with it. 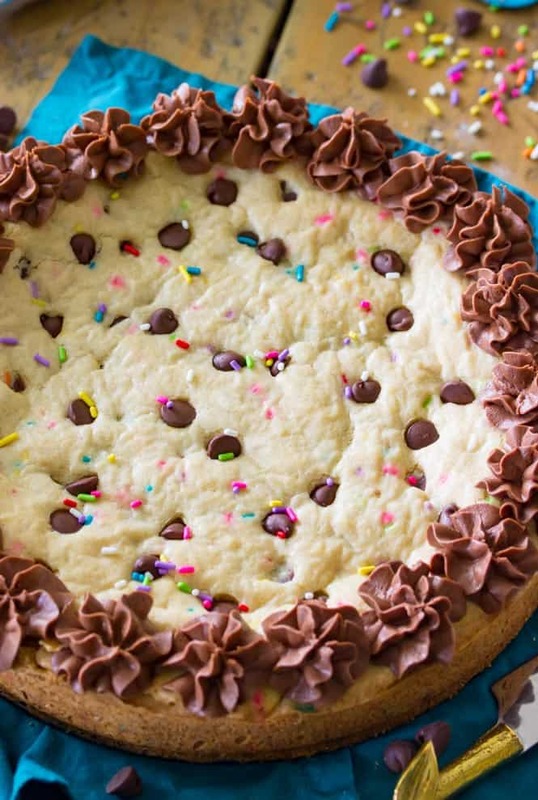 OK, if anyone wants to come pry this cookie cake out of my hands and drag me to the gym right about now, that would be greatly appreciated. Preheat oven to 350F (175C) and prepare a 10" round pan by lining the bottom with parchment paper or by lightly greasing. Set aside. combine softened butter and sugars in a large bowl and use an electric mixer to beat well until light and fluffy. Add eggs, and egg yolk one at a time, stirring well after each addition. Gradually stir dry ingredients into wet until completely combined. Stir in chocolate chips and sprinkles. Spread batter evenly into prepared pan. Bake on 350F (175C) for 30 minutes or until edges just begin to turn golden brown. Prepare chocolate frosting while the cookie cake cools. Stir in cocoa powder and then vanilla extract. Pause to scrape down the sides of the bowl with a spatula. Pipe icing around the rim of your cooled cookie cake -- I used a piping bag fitted with a Wilton 2D tip, but in a pinch you can simply transfer your frosting to a ziploc bag, snip off a small corner, and pipe that way. So fun! I followed the recipe precisely and my cookie cake turned out great! Very dense and moist in the center. The edges did get a bit crispy for my taste, so I may try cutting the recipe in half and reducing the bake time on my next attempt. The chocolate frosting is delicious, though not entirely necessary considering the richness of the cookie. But who am I to argue with more chocolate?!?! Wow, this looks soooo good, and easy to make– Yum! Definitely trying this soon! You are so funny, Sam… 😀 Thank you so much for sharing, and Ihope you enjoy your sister’s birthday!